Once you’ve spent enough time collecting knives or cleaning game, you’ll come across a name that will become a hallmark of your lexicon as an outdoorsman, and that name is Buck. Founded by a blacksmith over one hundred years ago, Buck has grown into a legend told and retold by the people who carry the blades and by the feats of the blades themselves. Buck has become so respected that a “Buck knife” is quite literally a ubiquitous eponym for a quality blade, and rightfully so. Because of attention to detail, a new tempering process and quality workmanship proven through decades of hard use in the fields and woods, Buck has earned a place in the hearts both of critics and hunters alike. Frequently beautiful and practical at once, Buck Knife Blades can be found in models, both fixed and folding, to suit nearly any task, be it in the field or in a shop. Buck knives have been proudly made in America for over a hundred years, and come to the buyer razor sharp – no stropping required. Out of the package, buck knife blades will poll hairs with barely a whisper. Yet sharpness isn’t everything, and anyone with a stone and a strop can do the same, so then it’s on to the workmanship. Buck makes ruggedized models sporting micarta scales and rubber grips, but they also offer blades with ebony scales and brass bolsters or chrome hardware. You may not find these knives in the Louvre, but they will greet your eye pleasantly and will be sure to make an ergonomic fit in your hand. If sharpness and ergonomics, then, are still insufficient, it’s on to the proof of labor. You may try your hand at splitting wood for kindling, whittling feather sticks or figurines, gutting and filleting fish or birds, or carving up bait for drop lines, and you will hear neither complaint nor lamentation from Buck knife blades. They will deliver and deliver and continue to deliver until long after the user flags. As far as selection, Buck offers everything from paracord appareled survival knives to slender fillet knives and everything in between. If you’re looking for a classic that will stand up to nearly any task as a general hunting or camp knife, you need look no further than the Buck models 110 and 119. 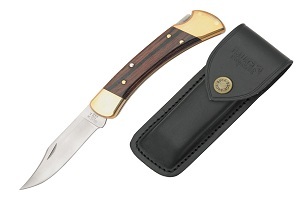 The model 110 is the best selling folding knife of all time, with sales estimates reaching nearly 15 million. It also pioneered a design that has since been replicated untold times in the industry. Featuring brass hardware and ebony scales, the 110 is at home preparing game and woodcarving, with a fine clipped point for detail and a heavy spine and sturdy lockback mechanism for strength. As for the 119, it is also a design around which many imitations have been created. One of the most iconic fixed hunting knives of all times, the 119 sports attractive chrome fittings, a guard and choil for additional utility, and an immensely strong blade. Between these options and the encyclopedia of other knives offered by Buck, there is something for every job. The question, then, is where to start your collection of Buck knife blades, and luckily it has an easy answer. White Mountain Knives has one of the greatest selections of blades in the industry and offers their stock at excellent prices. Even better is the fact that orders from White Mountain Knives in the United States ship free. Additionally, their vendor relationships enable them access to hard to find models that otherwise might be difficult to source. To get started, head to WhiteMountainKnives.com.